Disclaimer: New climbers, this is not how climbs generally go. Climbing is normally lots of fun. Don't read this and decide you don't want to begin climbing. A recent trip up Mt Hood had me ready to cancel this trip. The conditions were good for climbing but very unprotectable. Not good for a club climb. In the following days, we received several feet of new snow, which had me thinking that conditions would be ideal. Our team ended up staying Saturday night at the Mazama Lodge. Its a good opportunity to get to know folks but also a chance to get some sleep and not have the long, grueling zombie drive in the morning. Everytime I had seen Susie, she kept expressing how afraid she was that she wouldn't be in shape for the climb. She was even hoping it would get postponed another couple of weeks so she could get a few more sets of car lifting in. As expected, she lead the way to the top of the Palmer in just two hours. She trains w/ our very own Sue Nelson, they're doing something right. One of the things I love about climbing is that first couple of hours of mindless walking. Hearing the crunch of snow under a teams feet, you're kind of awake but it's also one of those out of body things. Everything was going well till we stopped at the Palmer to put on crampons. Between the wind and the cold, people we freezing up. Amy's hands were so cold, she could barely get her crampons on. Above the Palmer, there wasn't any snow left. Early in the week, there was a wind storm w/ sustained winds of 50+ mph. I'm guessing it blew all the snow away. You couldn't just walk, one foot in front of the other, you were having to place each foot around what I'm going to call chicken heads. They looked like they were caused by the high winds and sun. Very tedious. Mike Neimeyer, in search of his own glory, turned back somewhere near the triangle moraine. (I'll explain later) Above the moraine, the terrain got worse. We didn't see any more snow except for a little patch either side of the Hogsback ridge. The slope angle was pretty steep and very icy. The Sewell's got their first taste of exposed challenging terrain. I keep telling them its an aquired taste. When we all arrived at the top of the Hogsback, it was looking pretty grim. We froze some more then roped up. As we were working our way up the Hogsback, there was a little patch of snow 3 feet to either side of the ridge. When I was walking on it, I noticed it wasn't bonding well to the ice beneath it and it was sloughing off. Between the unbonded snow, high winds, bone chilling cold, difficulty of the route ahead and the fact that I had already been surprised by the difficulty of just reaching the hogsback, I decided to put a stop to the misery. Sometimes, a few little things add up to turn you back and you're left wondering if you should have pressed on. This wasn't one of those times. There were alot of big things adding up. After all, climbing should be fun right? It's important to remember that the mountains have teeth. No need for a new chapter of "Climbers trapped on Mt Hood" and of course, "Channel 2 was there." We had to do some belaying down the Hogsback because of its exposure and difficulty. Too soon, we were back dancing around the chickenheads. Click the picture to see what the upper mountain surfaces was like. We've forgotten about Mike Neimeyer! Ok, let me back up just a bit. When we first reached the Hogsback, we encountered a pair of climbers. They had just decided to turn back, one had bonked. They headed down as we headed up. A minute after we decided to turn back, Scott got a call from Mike Neimeyer on the radio. Mike was back at the lodge hustling around looking for a news camera and he struck gold. One of the climbers who turned back slipped on the ice below Crater Rock. (Like I said, it was very steep) He was able to self arrest but dislocated his shoulder. Mike let us know that they were going to be sending a PMR team up. Mike worked w/ the Sherriff to let him know that we had a team on the mountain. They decided that they would wait till somebody from our team reached the injured climber to evaluate the situation. I stayed w/ the team, obviously, while Scott (WFR certified thank you very much) worked his way down to the injured climber. Scott helped them to get down to the lower mountain where the Cat could collect them. Mike communicated w/ the sherriff the condition of the climber and let him know that the climbers were going to get themselves down to the Cat. Everybody was glad Scott and Mike had radios. The Hero, Scott Phillips gets ready to board the Cat for a free ride down the mountain, if I'm not mistaken, I think I saw him stick his tongue out at us as they left. So once again, Mike Neimeyer, Rescue Spokesmodel, saved the day. It was pretty cool to see how some basic logistics and Climber Camaraderie can keep the black hawks and news channels away. The next morning, Mike received a call thanking him and Scott for helping. It was pretty darned cool. We continued down the mountain slowly but surely. By the time we got to the Palmer, our hands and feet finally thawed out. At the bottom, alot of things had changed. People were smiling again, nobody was wearing 3 jackets. Dan had said that when he was at the top, he was ready to stick to Smith Rock. Now that he was at the bottom, moments from a cheeseburger, he was asking if we were going to schedule a rematch. Climbers memory. For me, climbing is always fun, even when its not. If this makes sense to you, seek help. I feel like the two most important parts of climbing are to first be safe; second, have fun. At the end of the day, I think we all were safe, we had some fun and we all learned something about ourselves. I say it was another good safe day in the mountains. Had we pressed on, I can see several situations that could have played out. Perhaps we would have been forced to turn back further ahead because of difficulty of terrain. Possibly the high winds could have knocked some of that exposed ice down and clobbered us, or hung up in our rope and pulled us down. 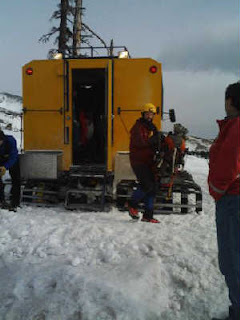 Maybe we would have gotten safely up and down but having to work the gear in would have been tough and time consuming; we'd have gotten colder by the second. I thank the team for understanding the decision to turn back. No arguments, no complaints. I didn't want the situation to get hairy. You can't always make it to the top, but you can always make it to the bottom.